Do you have any questions about this site? We hope to answer them here! And compete against other armies, there are many different groups, but we are one of the best, as you can see from the above picture, we do a lot of trainings, battles and tournament rounds against others – It is a lot of fun! If someone breaks these rules, we have countermeasures in place to stop it happening again. We have staff on chat almost 24/7 to ensure these rules are enforced, the staff members Include Moderators and Owners, who have the power to kick and then ban Rule-breakers. Owners have the power to kick and Ban rule breakers, they can ban them for life if the situation demands it, they can be identified by the orange figure by their name. If someone breaks a rule, our fist option is to kick them, this is where we remove them from the chat so they have to rejoin, and mute them for 15 seconds so they cannot talk. Only staff can do this, so there is no chance for someone to abuse this power. If kicking does not work, our second option is then to ban the rule breaker; This then separates the user from the rest of the community, into a separate chat which they cannot rejoin until their ban is over. We have these rules in place to protect our soldiers of all ages, and don’t worry, all our staff are teenagers who started as members and earned the position by following rules and we trust to be reliable. The benefits of Joining the Global Defenders Include improved social skills, responsibility and leadership roles in a team, the chance to meet people of different cultures worldwide, good sportsmanship and, during some events, leadership skills. 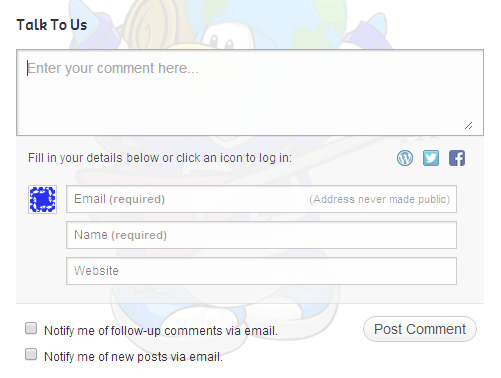 You can comment on pages by filling in the form or every post, but don’t worry, the email address is not displayed, and we will not send you any spam emails. 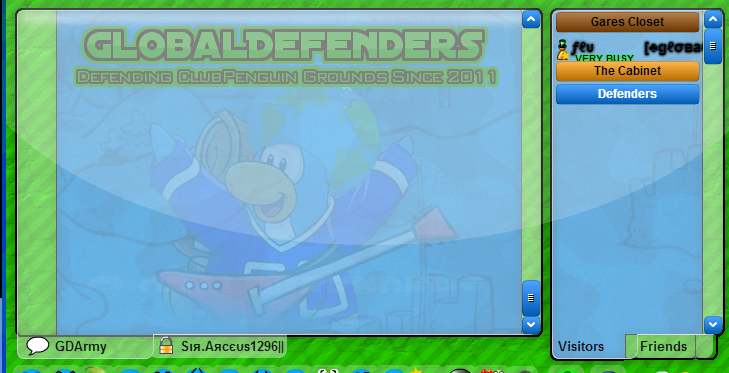 And PLEASE do NOT use your real name, use your ClubPenguin name. Before every comment is posted, we have to accept it, and we can edit out any cussing or inappropriateness. If you have any other questions, feel free to come onto our chat, we try to have at least one staff member on at all times, so Private chat them and ask them a few questions! We hope your children have fun here!